Stripping with hot sand is not a new process. 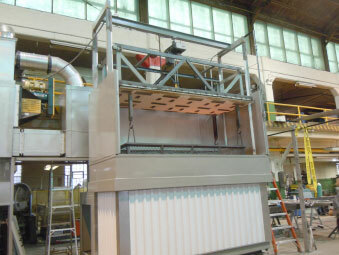 In fact, we installed one of the first hot sand stripping units in the early 1970’s at a large sewing machine Company. There was a very important reason for selecting hot sand. When fully machined, the sewing machine castings go through several steps of machining, which makes the casting extremely expensive. When the sewing machine company decided to use powder coatings on their new model, they had to come up with a process to strip the rejected parts without destroying the machined section of the casting. After extensive testing, they found that hot sand stripping was the only solution. 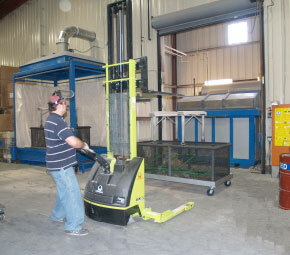 The system was off-line and semi-automated, but it took a comparatively short time to strip the powder coating. Since then, there have been many improvements to the hot sand process that have made hot sand stripping a very viable method. The Pyro-Strip Process that we will discuss in this case study, is one of the systems available that have demonstrated excellent success in both off-line semi-automatic and batch processes. 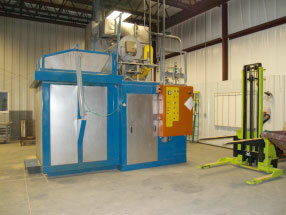 The PYRO-STRIP Fluidized Sand Tank System is designed for the rapid burn-off cleaning of hooks, racks, fixtures and reject parts which have been coated with organic paints, powder coating or thermo-plastics materials. The parts to be stripped can be steel, iron, bronze, and aluminum for recycling. The parts are loaded into a basket that is then hoisted into the tank where the fluidized hot sand scrubs and burns off the organic material and vaporizes it without damaging or warping the work pieces. The cleaning cycles take from 20 to 40 minutes at a temperature of 800 to 850 degrees Fahrenheit. The time cycle is regulated by the mass of the load and amount of organic material to be removed. 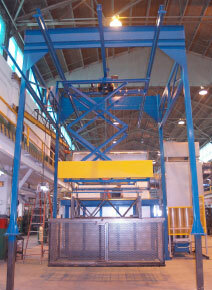 The basket of cleaned parts is lifted with the hoist out of the Tank and set to cool. In most cases, the work pieces don’t need any de-ashing, since the bubbling action removes most ash coating from the surface. The PYRO-STRIP Fluidized Sand Tank System utilizes a special compressor to fluidize the calibrated quartz sand inside the tank. The fluidizing air, premixed with the combustion gas, then burns on the surface of the sand bath by a constant burning pilot. The combustion gas supply is modulated in accordance with the heat energy generated by the burning of the organic materials, which is absorbed by the sand, thus reducing fuel consumption. The combustion system is designed with a timer program of enriched burner gas flow for approximately the first ten minutes of the cycle in addition to the regular burner output. This program is activated each time the batch timer is started by the operator from the Hoist Pendant push-button. The enrichment further incinerates the smoke and fumes generated in the initial heating of the product. The burner is controlled ON/OFF by the temperature controller for an additional program time cycle of approximately ten more minutes for complete incineration of the organic matter. 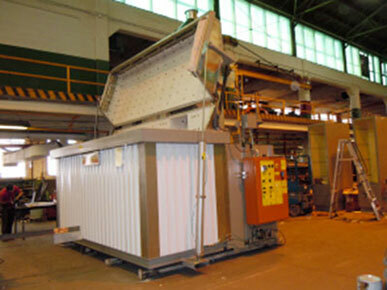 The balance of time of the stripping cycle is the fluidizing action of the sand removing the residues from the product. The program timers are set for the general cycle requirements for the product being processed. The heated sand mass burns the organic coatings on the submerged work pieces. The vaporized residues rise to the surface of the sand and are incinerated by the flame of the pilot and the combustion of the fluidizing air-gas mixture. In this combustion zone, oxygenation elevates the flames to nearly 1600 degrees Fahrenheit, incinerating and purifying the flue gases. The hot gases rise and are collected in the post-combustion chamber where the hot gases are exhausted. The lid and the exhaust plenum are lined with refractory insulation rated at 2200 degrees Fahrenheit. The exhaust flue gases contain dust particles generated during the initial stages of the burn-off process and very fine sand particles. The local emissions jurisdiction may require the flue gases to be further cleansed by an optional cyclone separator or a particulate collector before being released into the atmosphere. For certain particulate emission compliance, the post combustion chamber can be outfitted with an after-burner that further incinerates the flue gases. The output capacity is the amount of organic material that can be safely incinerated without overloading the System. The capacity is dependent upon the nature of the organic material, rate of gasification, the caloric value and the film thickness of the coating, quantity of laden solvent, weight and volume of the work piece, orientation of product, temperature of the process and the time cycle required for each load. Aluminum can be cleaned only if it is to be recycled, since the heat of the sand bath alters the metallurgical characteristics and it is not recommended for products such as aluminum wheels. Chlorinated or fluorinated material are not to be processed. Plastics such as PVC can damage the tank interior walls or fluidizer. The PYRO-STRIP TM Fluidized Media Tank System is a European design being fabricated in the USA, employing American equipment standards and domestically available components. The fluidized media cleaning is the method of choice for its economical and ecological excellence. 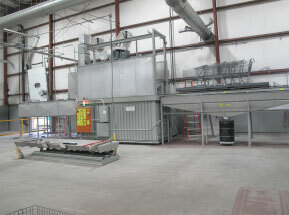 The equipment being fabricated is a proven technology with safe and simple operation, and robust construction required for hard working paint lines.